The debate in this forum between Lam (2017) and Grossman (2017) concerning the outlook for the world’s next four billion people is opportune. Both essays highlight critical issues and make key points, but also leave serious gaps. Lam correctly observes enormous improvements in human welfare over the last few decades, but his optimism for the future requires a leap of faith over huge environmental obstacles. Grossman fittingly notes that human progress will be stymied by continued ecological destruction, but overestimates the power of demographic control responses. In my understanding, four points need further review: a) the urgency of environmental threats; b) the recognition of diversity in “population”; c) the limitations of fertility reduction solutions; and, d) the urgency of redirecting “development”. Physics teaches us that it is impossible to produce something from nothing, and vice-versa. Environmental sciences confirm this law by verifying the infringement of key planetary boundaries – including the collapse of biodiversity and climate change – caused by “development” through economic growth (Rockström et al. 2009; Steffen et al. (2015). The greater and more widespread such growth, which devours natural resources at an exponential rate, the more damaging its environmental impacts. The belief that this form of development can continue indefinitely or universally is the greatest hoax perpetrated by our civilization. Present-day optimists futilely bet on technology to resolve ecological problems. Though essential in any environmental solution, technological progress guarantees no quick and easy fix. Critical resources are finite and most solutions simply transfer problems from one area to another. Moreover, as Jevons originally noted, each new technological advance, upon enhancing the efficiency of a natural resource, intensifies its total use (Polimeni, J.M., et al 2008). Thus, technology actually promotes consumerism, which is why the fantastic technological advances of recent decades have caused an unprecedented explosion in the use of the Earth’s materials (UNEP 2017). More distressingly, technology has no autonomous influence on today’s disturbingly bizarre political and environmental processes. Indeed, the control and use of technology, such as in the geopolitical manipulation of computation and armaments, has warped into a major global nightmare. Even before the simplistic I = PAT formulation, population size was central in discussions of population and environment relations. Though the literature has considered other demographic factors, policy debates still focus on global size.² These discussions generally continue to assume that “population” is composed of homogeneous and interchangeable socio-economic units imposing similar burdens on the environment. This ignores huge disparities in environmental impacts between, for instance, an average American and an average Sub-Saharan African. The wealth pyramids prepared by the unassailable Crédit Suisse note that the poorest 3.5 billion adults account for only 2.7% of global wealth. 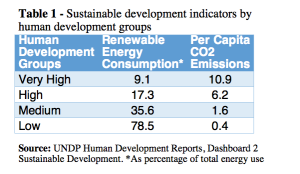 Unquestionably, richer people consume more and degrade more (Table 1). Since most of the projected four billion will be born in poor, high fertility countries, they will not have a major environmental impact – unless they are somehow integrated into “development”. Failure to explicitly recognize diversities within “population” fosters misleading policy conclusions. Contrary to popular opinion, flooding a region or group with family planning services does not guarantee rapid population decline. Providing quality reproductive health services to millions in need is splendid from the standpoint of individual rights. However, without some degree of social development – including education, women’s empowerment, mortality reduction and perceived prospects for improved living conditions – family planning services have a reduced influence on short-term fertility in poor countries. Nor do they reduce growth rapidly, because of demographic inertia. China has experienced an increase of over 500 million people since adopting a radical fertility control policy in 1979. India has added 950 million people since it began implementing family planning programs in 1952. Brazil experienced very rapid fertility decline after 1965, spurred largely by urbanization (Martine, Alves and Cavenaghi 2013), but has since added 130 million people (UNPD 2017). Such experiences obviously attest to the importance of earlier fertility decline for longer-term environmental purposes, but provide little hope for resolution of the immediate crisis via population decrease. Moreover, since fertility reduction at the household level is associated with improved living conditions, it is also conducive to increased consumption per capita, thereby negating aggregate gains from a smaller population. In short, we need to look elsewhere for effective solutions than in the population decline panacea. The persistent but unproductive clamour about population growth overshadows the fact that the current crisis originated some decades ago in the production and consumption processes of the world’s richest 20%. 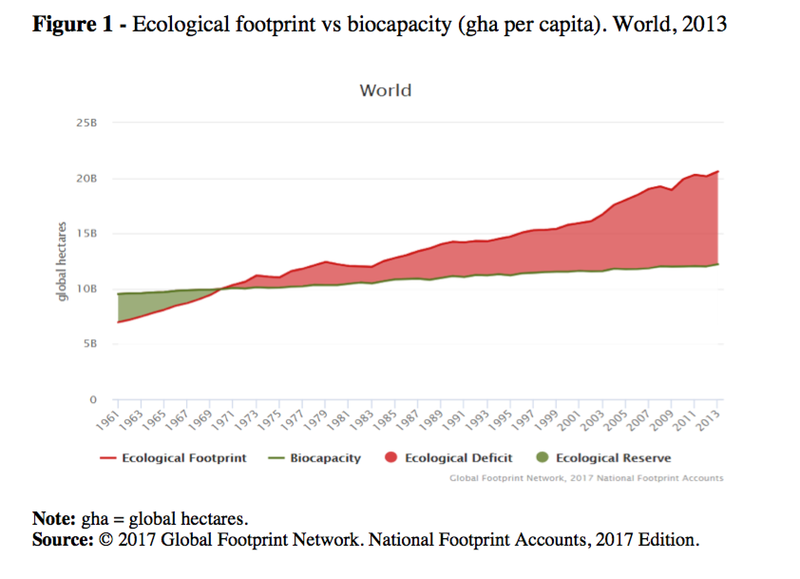 The subsequent spread of “development” accelerated global degradation, as illustrated by the “ecological footprint” – an instrument that measures the impact of humankind on the biosphere. Figure 1 shows that the planet’s biocapacity was first surpassed in 1971, when world population was under four billion and the number of consumers linked in to the dominant throughput growth model was about 20% of that. Subsequent “development” and inclusion of new consumers has rapidly increased the deficit. The Planet’s total biocapacity is 12.²²²3 billion global hectares (gha). Sustainability ultimately means living within the limits set by this total. Moreover, these resources should ideally be divided equitably among the world’s population. 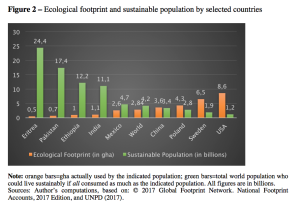 However, ecological footprint measurements, collated with population figures for selected countries in Figure 2, reflect both unsustainability and enormous disparities between countries. Given average consumption levels, the world can only harbor 4.2 billion people sustainably. If another four billion people are added to the current total, sustainability with equity could only be achieved if average consumption levels of the world population were similar to those of India. The consumption levels currently prevalent in mid-range and highly developed countries already overshoot biocapacity limits. 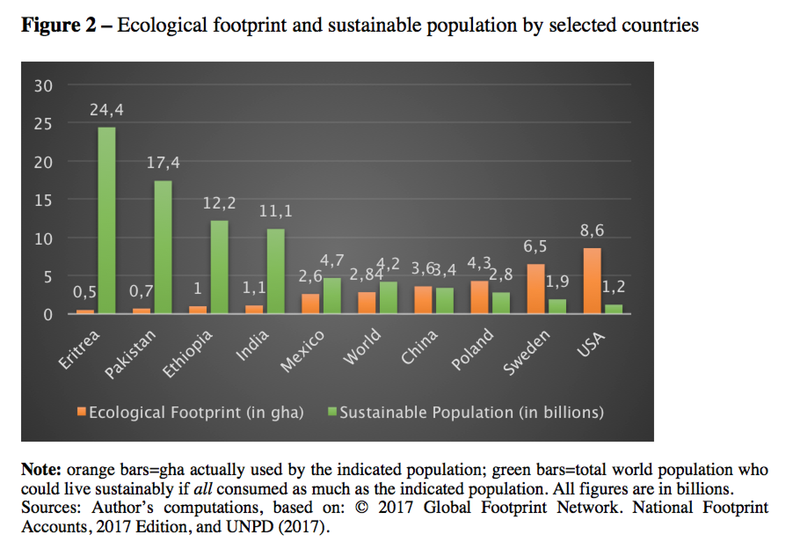 With a footprint the size of the USA’s current population, the planet could only harbor 1.2 billion people sustainably. In short, ecological chaos is actually being delayed by slow “development” and inequity. Such exercises dramatize the point that immediate ecological threats stem, not from increases in the absolute population, but from the number of people being integrated into the current development paradigm founded on consumerism (Wilk 2017). Even today, only one-third of the world’s inhabitants can be classified among the middle class consumers who are contributing to global irreversible environmental problems. Improving the lives of the remaining two-thirds of the world’s population who do not yet participate in this cornucopia is a universally recognized moral imperative, but one that is impossible to fulfil under the current development paradigm because it would cause insupportable pressure on the Earth’s biocapacity. In this light, the critical challenges posed by an additional four billion people stem more from a moral perspective than a strictly environmental standpoint. The major ethical predicament of our times is that the incorporation into “development” of huge additional masses of people – whether from current or projected populations – is physically impossible without drastic changes in the use and allocation of natural resources and wealth. Consumerism and economic growth make up a formidable but ultimately maleficent global system. Needed solutions are eminently political, involving a radically different use of scarce global resources. Outlooks for such crucial changes are dim, however, since both national and international development agencies are tenaciously focused on growth. The SDGs and COPs demonstrate that global governance initiatives are similarly unwilling to deviate from this quest. Thus, Goal #8 of the SDGs proposes the very engine that accelerated our current environmental quandary, namely – the promotion of sustained economic growth by all. The Paris COP proposed ineffectual non-binding limits, and similarly failed to address the need to redirect “development”. Ultimately, the “population problem” is much less relevant than, say, livestock increases (also driven by development) in the imminent ecological collapse. Given the trajectory of degradation caused by the richest third of the global population, the planet we know could well be thrashed even without the addition of a single baby. What we urgently need, therefore, is a reality check on our cherished “development” paradigm. Martine G. and Alves J.E. (2015). 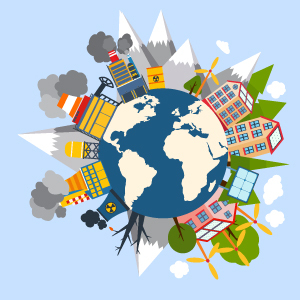 Economy, Society and Environment in the 21st Century: Three Pillars or Trilemma of Sustainability? Martine G., Alves J.E. and Cavenaghi S. (2013). Urbanization and fertility decline: Cashing in on structural change. Polimeni, J.M., et al (2008). The Jevons Paradox and the myth of resource efficiency improvements. London: Earthscan, 2008. 201 p.
Steffen, W. et al. (2015) Planetary boundaries: Guiding human development on a changing planet. Science, 13 Feb. Vol. 347, Issue 6223. UNEP – United Nations Environment Programme. (2017). Resource Efficiency: Potential and Economic Implications. A report of the International Resource Panel. Paris. 168 p.
Wilk R. (2017). Without consumerism, there is no environmental crisis. ¹ A general overview is provided in Martine and Alves (2015). A plethora of multi-authored articles published in leading journals such as Science, Nature, Ecology and Society and others over the last three years are just a sample of the vast documentation supporting these concerns. 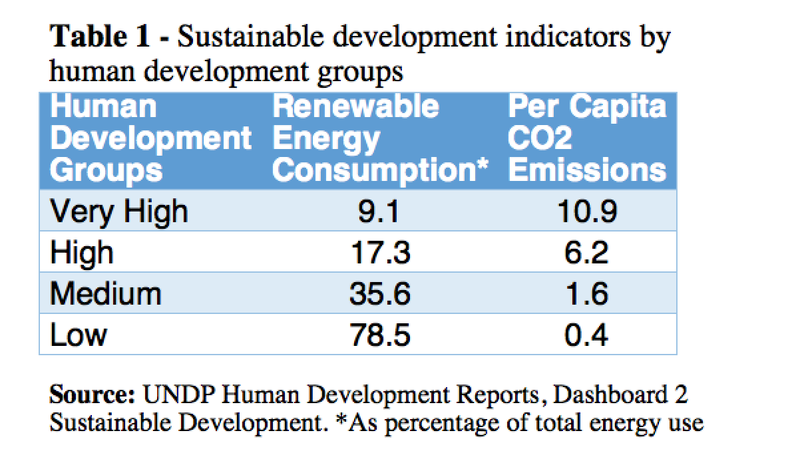 Source Table 1: UNDP Human Development Reports, Dashboard 2 Sustainable Development.